What is karma? It means work. Suppose you have to make a vesti (dhoti). There are a number of processes, a number of works for it. The cotton has to be gathered from the field; it has to be cleaned and spun into yarn; then the yarn has to be woven into cloth and dyed. In the same way a man has to be made a knower of the Atman through a series of rituals. Karma has to be performed in such a way as to purify him both outwardly and inwardly. Such a karma is called samskara. That which removes the impurities from an object, takes away all the bad or evil elements, and imparts good qualities to it is samskara. For instance, we talk of "kesa-samskara". It means shaving or delousing and applying oil to the hair. Samskara is like combing the hair and applying oil to it. Certain types of samskara are conducted on land. First the land is allowed to dry in the sun, then it is ploughed and irrigated. Seeds, say, of paddy, are sown and after they sprout the seedlings are transplanted. The weeds are removed, the field irrigated again and the excess water drained off. When the corn is ripe, the crop is harvested, threshed and the chaff winnowed. The paddy has to be "seasoned" and pounded before the rice is used. How many different steps are there in making cotton into a vesti. The weaver has to take great care that the yarn does not get tangled. Our Self is in a tangle caused by the senses. It has to be untangled and made eternally happy. There are many obstacles to accomplishing this. Now and then we experience some happiness in the midst of all our trouble and suffering. This happiness must be made to endure for ever. For that we must go to Brahmaloka. In the presence of Isvara there will be no sorrow. After the great deluge we will become one with him. We have to prepare ourselves now itself towards that end. 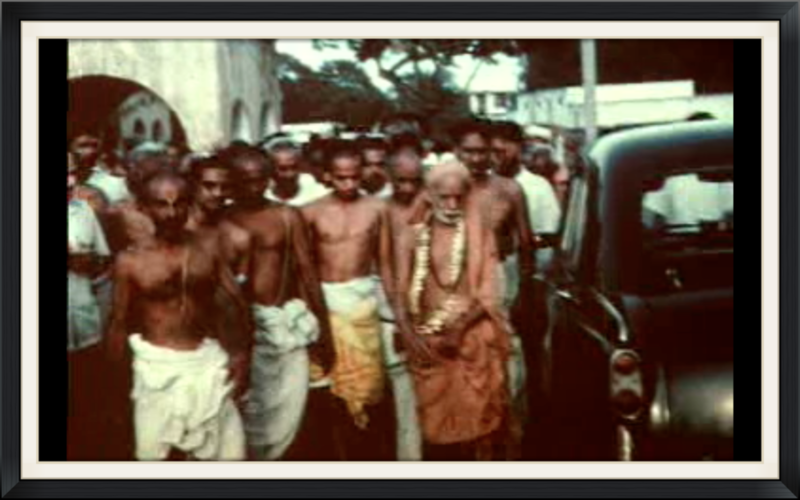 The sages have laid down the forty samskaras and the eight "Atmagunas " for this purpose. When we use the term " Atmaguna " or speak about the Atman being rendered pure, there is a suggestion that we are dualists ( Dvaitins ) who hold that the individual self is different from the Paramatman. In truth there is only one Atman, one Self, and there is no difference between the jivatman or individual self and the Parabrahman. The Self is ever pure. So it is wrong to believe that it has to be purified by the samskaras. It is nirguna, unconditioned and without attributes. So it is also wrong to speak of what are called Atmagunas, since the Atman has truly no gunas or qualities or attributes. However in practice, owing to Maya we do not realise that we are the Atman without qualities. It is the Self perceived in our dualistic life that is referred to when we speak of samskaras and it is full of impurities that have to be removed through the samskaras. It has also durgunas or bad qualities which have to be removed by cultivating the eight good qualities. Once we succeed in this, there will be neither any samskara nor any guna. We will transcend all gunas, all qualities, including the highest of them, sattvaguna. Finally there will be only the Self without any karma, without any gunas and without any distinction between the jivatman and the Paramatman. But to come to this state we have to go through the process of samskaras and cultivate the eight Atmagunas. If we wish to emulate the example of the noble character of the Puranas, we will have to contend against various obstacles like our attachments and desires, our feelings of hatred and fear. We will have to be disciplined through works and we will have to observe the rules about our daily routine, about how we should sit and stand and eat and dress. In this way we will rein in our mind, subdue our passions and ego, and our feelings of anger, hatred, fear and sorrow will gradually wither away. The samskaras and Atmagunas are interconnected. They will help us to acquire the qualities of the noble Puranic characters whose stories we listen to or read.